1 School Sponsored Trips Athletics. 2 Student Travel Approval for all student travel requests is at the discretion of the School Administrator, Assistant. 2 2 Student Travel Approval for all student travel requests is at the discretion of the School Administrator, Assistant Superintendent for Human Resources, and the Area Assistant Superintendent. Regardless of the availability of funds for these trips, both school and district approval is required. A chaperone-to-student ratio of one adult to 15 or fewer students will be maintained for optional student travel for secondary schools. These chaperones are considered required chaperones. All costs for Approved optional student travel (single day, in-state, overnight, out-of-state, and international) must be funded from student club funds, school athletic funds, ECA funds, gifts/donations, grants, community education and/or camp monies. These funds may also be referred to as School Funds. These costs may include but are not limited to, airfare, ground transportation, rental vehicles, fuel, lodging, substitutes, and meals. All non-required chaperones must pay their own expenses. Non-required chaperones can either deposit the cost of their trip expenses into a club account or pay the vendor directly. Student club funds may be used to pay the cost for both required chaperones and/or students for approved optional student travel. When student club funds are used to defray the cost of a trip, the appropriate student group needs to vote and approve the use of their club funds. This needs to be reflected in their club minutes. Contact Student Activities on extension 20133 for more information on the use of Student club funds. ECA monies can be used to pay the expenses for both required chaperones and/or students for approved optional student travel. State law prohibits the use of these funds to pay for recreational, amusement or tourist travel. Once ECA monies are placed into an ECA account, they are NOT refundable even if the trip gets cancelled. Contact Student Activities on extension 20133 for more information on the use of ECA funds. 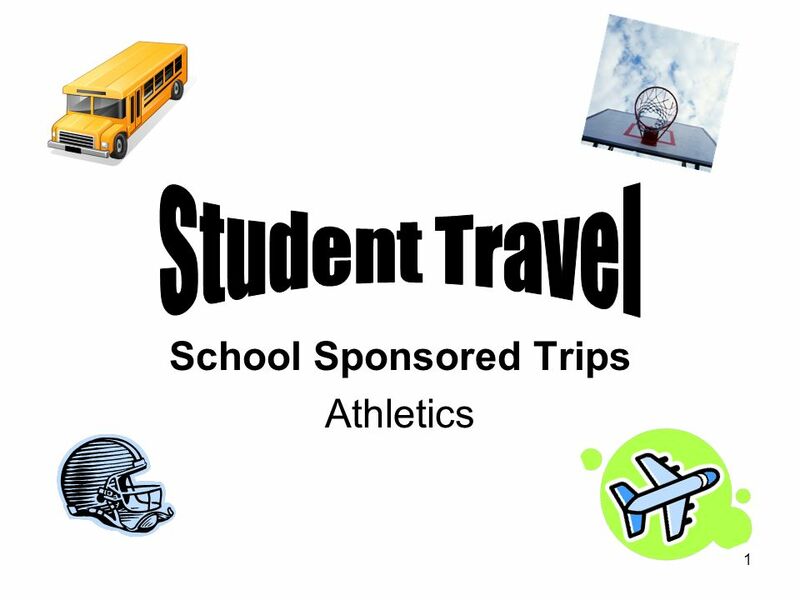 School athletic funds can be used to pay the expenses for both required chaperones and/or students for approved optional student travel involving an athletic team. 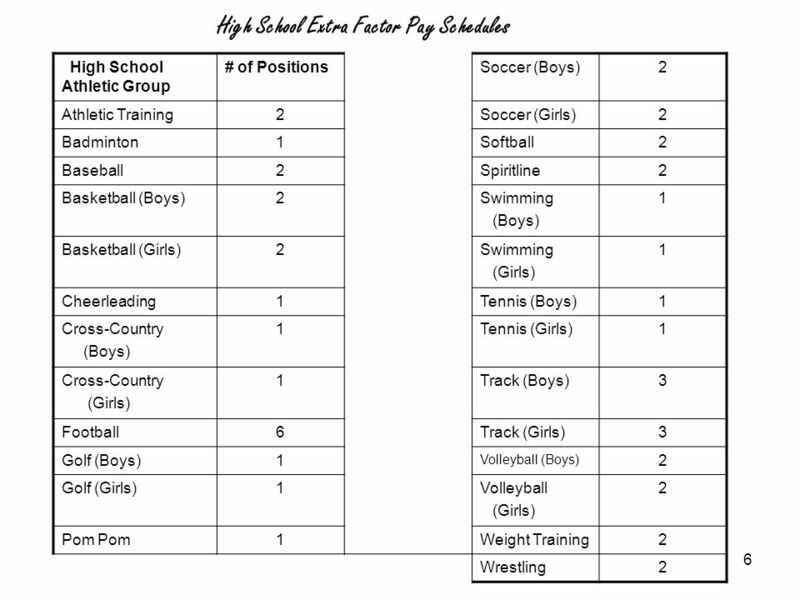 Contact Student Activities on extension 20133 for more information on the use of school athletic funds. Only MPS District Employees who are considered required chaperones and/or students can use gifts/donations, grants, community education and/or camp monies for travel expenses. Contact Travel Services on extension 20158 for more information on the use of these funds. 3 3 All changes go into effect for any trip scheduled August 1, 2008 or after. 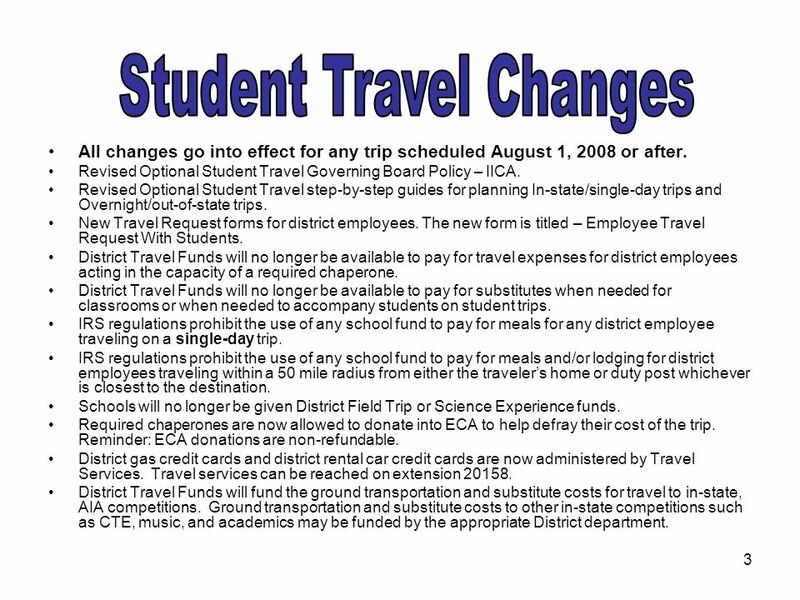 Revised Optional Student Travel Governing Board Policy – IICA. Revised Optional Student Travel step-by-step guides for planning In-state/single-day trips and Overnight/out-of-state trips. New Travel Request forms for district employees. The new form is titled – Employee Travel Request With Students. District Travel Funds will no longer be available to pay for travel expenses for district employees acting in the capacity of a required chaperone. District Travel Funds will no longer be available to pay for substitutes when needed for classrooms or when needed to accompany students on student trips. IRS regulations prohibit the use of any school fund to pay for meals for any district employee traveling on a single-day trip. IRS regulations prohibit the use of any school fund to pay for meals and/or lodging for district employees traveling within a 50 mile radius from either the travelers home or duty post whichever is closest to the destination. Schools will no longer be given District Field Trip or Science Experience funds. Required chaperones are now allowed to donate into ECA to help defray their cost of the trip. Reminder: ECA donations are non-refundable. District gas credit cards and district rental car credit cards are now administered by Travel Services. Travel services can be reached on extension 20158. District Travel Funds will fund the ground transportation and substitute costs for travel to in-state, AIA competitions. Ground transportation and substitute costs to other in-state competitions such as CTE, music, and academics may be funded by the appropriate District department. 4 4 Chaperone Travel Expenses Funding verification and approval must be received prior to travel or trip arrangements for all expenses, such as airfare, ground transportation, rental vehicles, fuel, lodging, substitutes, and meals. The expenses for required chaperones traveling with students can be funded from student club funds, school athletic funds and/or ECA if funds are available and if in compliance with District policies, Federal laws and State laws. 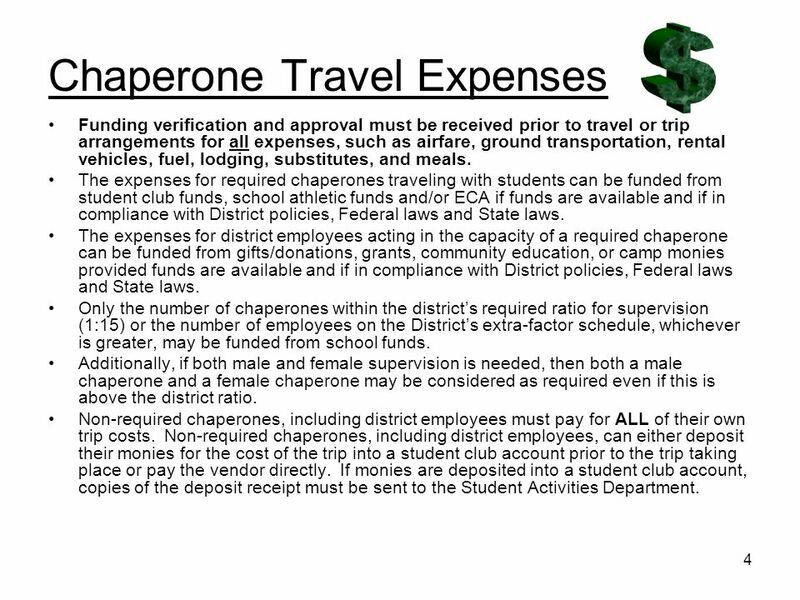 The expenses for district employees acting in the capacity of a required chaperone can be funded from gifts/donations, grants, community education, or camp monies provided funds are available and if in compliance with District policies, Federal laws and State laws. Only the number of chaperones within the districts required ratio for supervision (1:15) or the number of employees on the Districts extra-factor schedule, whichever is greater, may be funded from school funds. Additionally, if both male and female supervision is needed, then both a male chaperone and a female chaperone may be considered as required even if this is above the district ratio. Non-required chaperones, including district employees must pay for ALL of their own trip costs. 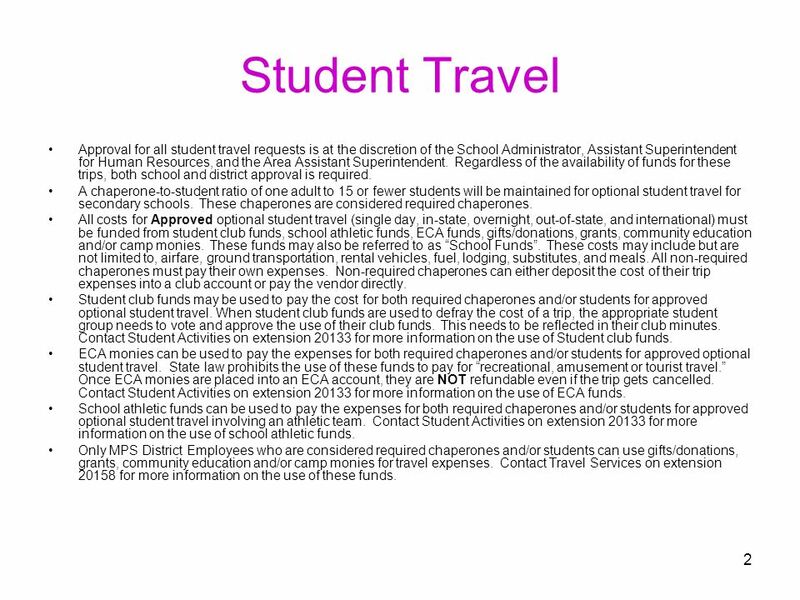 Non-required chaperones, including district employees, can either deposit their monies for the cost of the trip into a student club account prior to the trip taking place or pay the vendor directly. If monies are deposited into a student club account, copies of the deposit receipt must be sent to the Student Activities Department. 7 7 Ground Transportation Ground transportation includes travel by a school bus, a charter bus, a campus vehicle, a rental vehicle, or a district pool vehicle. Ground transportation for all approved optional student travel trips must be funded by school club funds, school athletic funds, ECA, gifts/donations, grants, community education or camp monies. 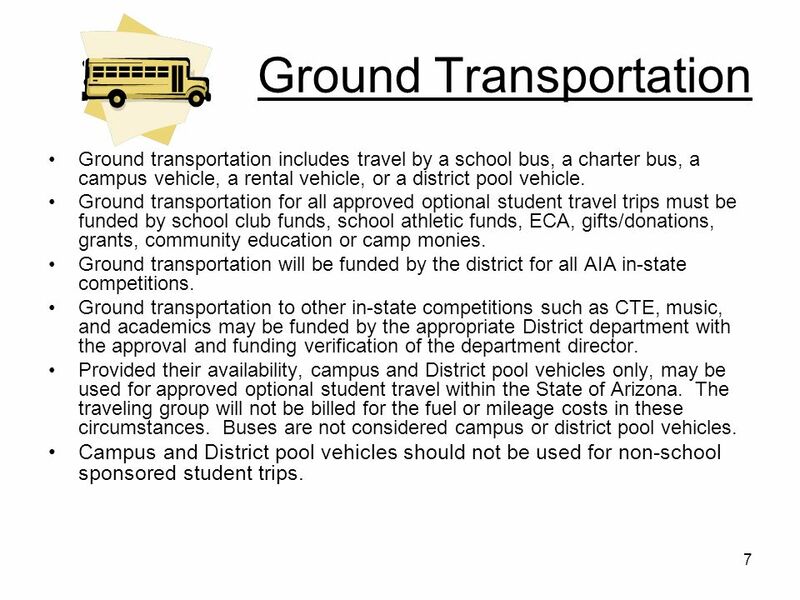 Ground transportation will be funded by the district for all AIA in-state competitions. Ground transportation to other in-state competitions such as CTE, music, and academics may be funded by the appropriate District department with the approval and funding verification of the department director. Provided their availability, campus and District pool vehicles only, may be used for approved optional student travel within the State of Arizona. The traveling group will not be billed for the fuel or mileage costs in these circumstances. Buses are not considered campus or district pool vehicles. Campus and District pool vehicles should not be used for non-school sponsored student trips. 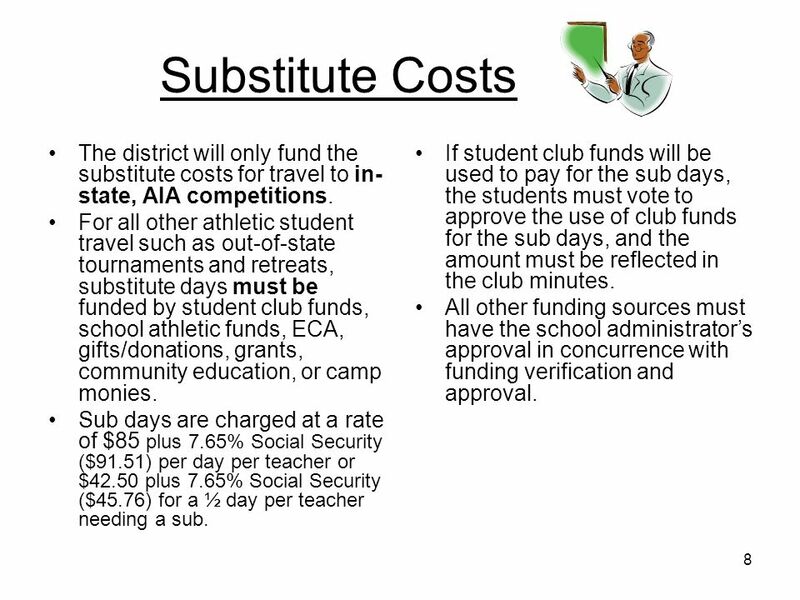 8 8 Substitute Costs The district will only fund the substitute costs for travel to in- state, AIA competitions. 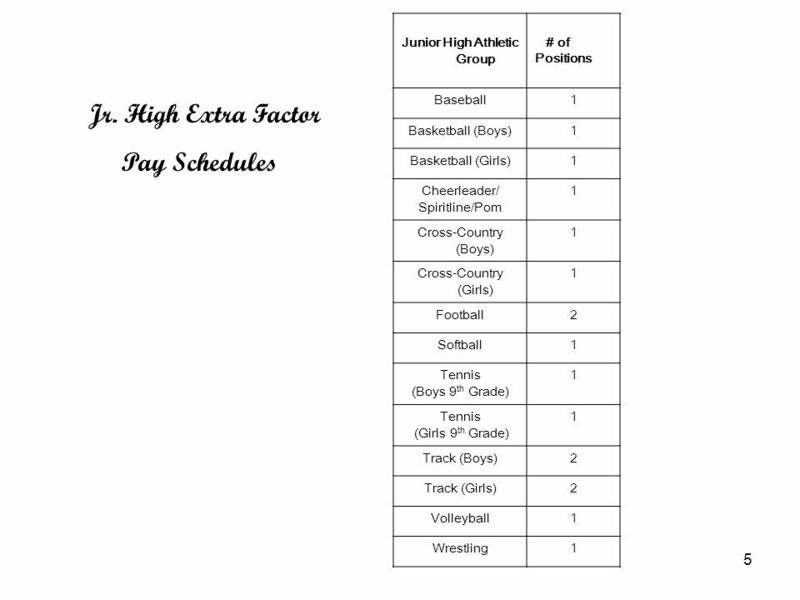 For all other athletic student travel such as out-of-state tournaments and retreats, substitute days must be funded by student club funds, school athletic funds, ECA, gifts/donations, grants, community education, or camp monies. Sub days are charged at a rate of $85 plus 7.65% Social Security ($91.51) per day per teacher or $42.50 plus 7.65% Social Security ($45.76) for a ½ day per teacher needing a sub. If student club funds will be used to pay for the sub days, the students must vote to approve the use of club funds for the sub days, and the amount must be reflected in the club minutes. All other funding sources must have the school administrators approval in concurrence with funding verification and approval. 9 9 Meals IRS regulations stipulate: a) Meals may not be reimbursed or paid by school funds for employees for single- day, non-overnight trips. b) Meals and/or lodging expenses for employees may not be reimbursed or paid by school funds for travel within a 50 mile radius from the travelers home or duty post whichever is closest to the destination. Meals and/or lodging can be paid for students and/or required chaperones who are NOT MPS EMPLOYEES. In cases where an overnight stay may be necessary for an MPS employee acting in the capacity of a required chaperone, for trips within a 50 mile radius, the IRS allows for some exceptions. Contact Travel Services or Student Activities to see if your situation qualifies as an exception. Club funds, school athletic funds, ECA, gifts/donations, grants, community education or camp monies can be used to pay for meals for required chaperones and/or students as follows: a) When ECA or school athletic funds are used, meals will be paid at the rates of $6 for breakfast, $8 for lunch, and $10 for dinner. Receipts must be turned in. b) When student club monies are used, the students must vote and approve a specific dollar amount to pay for each meal. This must be documented in their student club minutes. Receipts must be turned in. c) Only MPS District Employees acting in the capacity of a required chaperone and/or students can use gifts/donations, grants, community education or camp monies. When District employees use these funds, a completed Employee Travel Request form along with a student trip itinerary needs to be submitted and approved prior to the trip. If approved, the employee will be reimbursed based on IRS per diem schedules after the trip takes place. Receipts do not need to be turned in by the district employee. When these funds are to be used for student meals, contact Travel Services for procedures. 10 10 If it is felt that additional chaperones beyond District guidelines are required and that their expenses should be covered, only available ECA and/or club monies can be used. An appeal letter needs to be written. 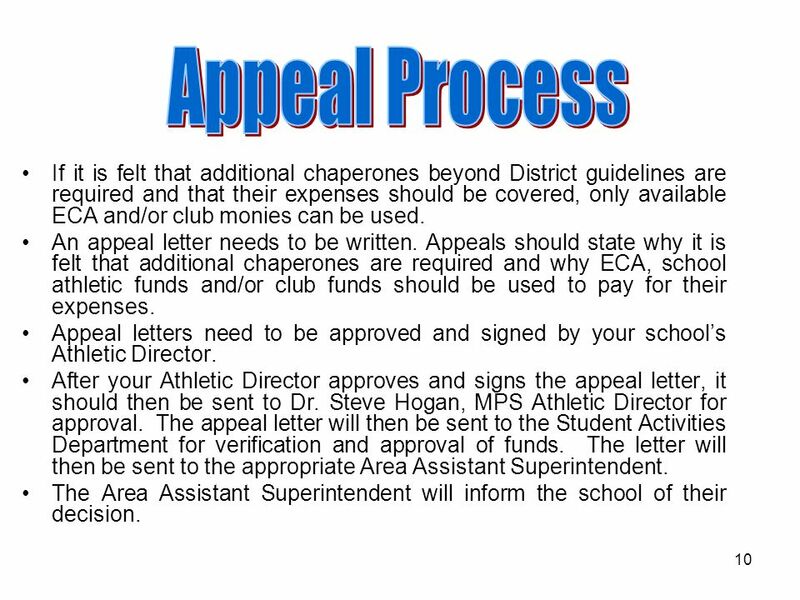 Appeals should state why it is felt that additional chaperones are required and why ECA, school athletic funds and/or club funds should be used to pay for their expenses. Appeal letters need to be approved and signed by your schools Athletic Director. After your Athletic Director approves and signs the appeal letter, it should then be sent to Dr. Steve Hogan, MPS Athletic Director for approval. The appeal letter will then be sent to the Student Activities Department for verification and approval of funds. The letter will then be sent to the appropriate Area Assistant Superintendent. The Area Assistant Superintendent will inform the school of their decision. 11 11 Planning an Optional Student Trip Before undertaking the responsibility of arranging an optional student trip, Governing Board Policy – IICA should be thoroughly read and understood. 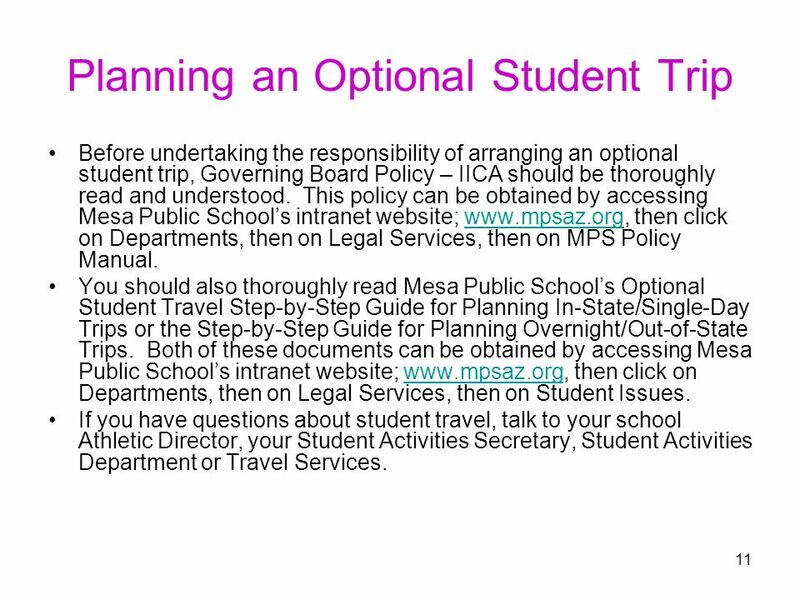 This policy can be obtained by accessing Mesa Public Schools intranet website; www.mpsaz.org, then click on Departments, then on Legal Services, then on MPS Policy Manual.www.mpsaz.org You should also thoroughly read Mesa Public Schools Optional Student Travel Step-by-Step Guide for Planning In-State/Single-Day Trips or the Step-by-Step Guide for Planning Overnight/Out-of-State Trips. 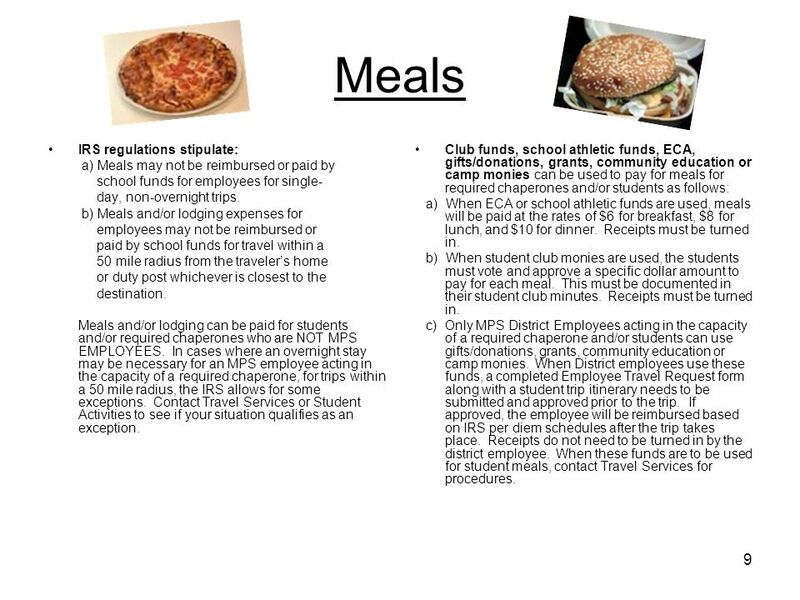 Both of these documents can be obtained by accessing Mesa Public Schools intranet website; www.mpsaz.org, then click on Departments, then on Legal Services, then on Student Issues.www.mpsaz.org If you have questions about student travel, talk to your school Athletic Director, your Student Activities Secretary, Student Activities Department or Travel Services. Download ppt "1 School Sponsored Trips Athletics. 2 Student Travel Approval for all student travel requests is at the discretion of the School Administrator, Assistant." Forms, Forms and More Forms What to use and when? New Teacher Meeting October 15, 2008. PLYMOUTH STATE UNIVERSITY Purchasing Card Program Assistant Coachs Card Athletics Department Revised February 2012. Step-by-Step Verify your vendor number Complete Travel Authorization Form Sign under claimant Attach agenda and documentation to support estimates for. Ed DuPree – Purchasing Leisha Moxness – Controllers. TRAINING YSU TRAVEL GUIDE UPDATES & CHANGES 2014. Commonwealth Travel Why are we here?  New travel policy  New travel agent  New online booking tool.  IRS Regulations - $.560 per mile (eff 1/1/14)  From official travel base or point of departure – whichever is closer to destination  Multiple destinations. Presented by: David Baird KSBA Interim Executive Director REVIEW OF THE AUDITOR EDELEN REPORT. Maricopa Community Colleges FY05 TRAVEL TRAINING Presented by Business Services Division District Support Services Center September 2004. DSC 2012 Travel Updates Teamwork makes the Dream Work! Traveling with Liberty ISD. Covered Topics Lodging Meals Transportation Miscellaneous Charges Procedures and Forms Fuel Credit Cards. Highlights of Policy Changes  GTE System Users: ◦ May 1, 2012  Non-GTE System Users: ◦ No later than July 1, 2012 ◦ Non-GTE Systems Agencies are not.